Only about 30 rocket-paced minutes have whizzed by before Mission: Impossible­—Fallout first flirts with truly impossible odds. Ethan Hunt, the human missile of American intelligence that Tom Cruise has been popping back in to play for more than 20 years now, is masquerading as a mysterious terrorist, the perfectly named John Lark, to buy back some plutonium he’s lost to a cabal of doomsday extremists. The bad guys, alas, will accept only one form of payment: the sneering anarchist supervillain Solomon Lane (Sean Harris), who Hunt put away in the last Mission: Impossible and is now forced to bust out of police custody to avert nuclear catastrophe. Forget, for a moment, the risk that our hero will unleash the world’s most dangerous man back on the world. How, exactly, can Hunt free his nemesis without either killing a lot of innocent cops or blowing his cover as an agent of chaos who wouldn’t think twice about leaving a trail of bodies in his wake? These kind of extreme dilemmas are all over the superior sixth entry in Hollywood’s most reliably entertaining ongoing franchise. Moving like the lit fuse that blazes brilliantly across the opening credits of both the original Mission: Impossible television series and its first big-screen adaptation, Fallout turns out to be a breathlessly exciting action spectacular: the blockbuster spy thriller as sustained endorphin rush. Escalation is the film’s nuclear energy source. It’s there, of course, in the downright lunatic stunts performed by Cruise, again defying good sense and his own advancing years to top his previous feats of reckless self-endangerment. 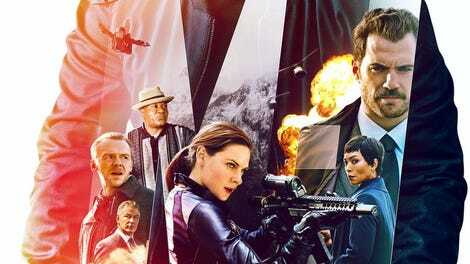 But it’s also crucial to the perpetual motion machine of a story, to the way writer-director Christopher McQuarrie keeps raising the stakes, dropping new obstacles, bringing these weary espionage specialists ever closer to the event horizon implied by the title. 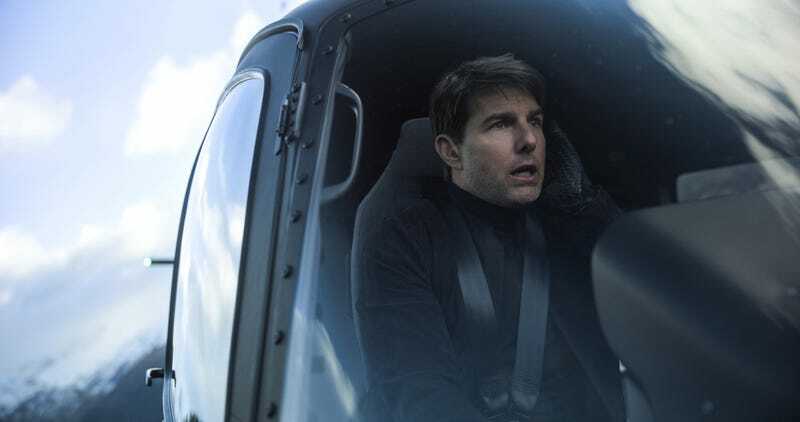 The plots of Mission: Impossible movies tend to be convoluted but negligible, really only there to provide connective tissue between jaw-dropping set pieces. Fallout is no exception; tracking who has the weapons-grade MacGuffin when can feel like an exercise in futility. But part of the movie’s nonstop fun is the way McQuarrie taps back into the genre’s (and this series’) games of subterfuge, misdirection, and indeterminate loyalties, beginning with the fiendishly clever rug-pull of its worst-case-scenario prologue and epitomized by the goofily irresistible sight of characters dramatically ripping off lifelike rubber masks. (One is reminded that the writer-director made his name through the big-twist architecture of The Usual Suspects.) For a while, the biggest question mark of allegiance is August Walker (Henry Cavill, subverting his man-of-steel screen presence), the brutish CIA tagalong feeding his superiors the theory that Hunt may really be going rogue after years of being left out in the cold by his handlers. Using the amusingly unreliable support of IMF as a plot point counts as one of the script’s most self-aware choices. Up until now, Cruise has passed the reins of each new M:I installment to a different auteur, resulting in the rare mega-budget series to operate in a constant, thrilling state of stylistic reinvention. (Call it the polar opposite of the Marvel house style.) But any disappointment about the rehiring of McQuarrie, who previously assembled the stirring greatest-hits package Rogue Nation, goes up in smoke like a self-destructing message the minute his return engagement kicks into gear. Like Brad Bird’s playfully virtuosic Ghost Protocol, the high point of this franchise in more ways than one, Fallout creates an endless daisy chain of spectacle, so that one stunning display of acrobatic nerve is barely over before another begins. McQuarrie’s globetrotting action—the Nolanesque demolition-derby of an extraction scene; a foot chase that unfolds across rooftops and through buildings; an aggressive fist fight in a pristine-white restroom—is robustly physical, privileging vantages that make the nerve-racking practicality of its execution obvious. While Rogue Nation nodded to Casablanca, here McQuarrie pays tribute to the subterranean scramble of The Third Man, another European-set thriller of reversals and betrayals and cracked moral worldviews. Often, the filmmaker just seems to be attempting to put every 007 and Jason Bourne adventure to shame. He comes damn close. Of course, the constant of this series—and arguably its anchor of artistic personality—is Cruise’s horizontal and vertical plunge into the fray, his habit of playing chicken with the laws of gravity and the realities of aging. In Fallout, the star leaps headfirst out of an airplane, steers a motorcycle into the famously deadly oncoming traffic of the Arc De Triomphe roundabout, and eventually pilots an actual helicopter during the movie’s most elaborate high-altitude highlight. (The various on-set injuries are likely badges of honor for a showman so unconcerned with his own safety.) Converting all his vanity, mania, and pathological need to amaze into kinetic energy, Cruise makes Hunt not just a remarkable force of pure determination but also a kind of slapstick comic figure. What are sidekicks Benji (Simon Pegg) and Luther (Ving Rhames) really around for but to provide straight-man reactions to his willingness to leap through whatever flaming hoop the universe puts in front of him? Naturally, Fallout also plays to Cruise’s waning appeal as a romantic leading man, supplying him with no less than three potential love interests. It’s no accident that the biggest sparks fly with Ilsa (Rebecca Ferguson), the MI6 double agent enthrallingly introduced in Rogue Nation. Their attraction is basically an extension of their sensation-junkie workaholism: When mission objectives are at odds, even romance becomes a high-wire risk. But who is Hunt, really? The best answer has always been a cipher in motion, the flesh-and-blood means to Mission: Impossible’s show-stopping ends. McQuarrie hands the secret-agent man the standard superhero anxiety about getting his friends and loved ones caught in the crossfire of his can’t-stop-won’t-stop exploits. But if Fallout has real dramatic stakes beyond minute-by-minute survival—its precarious balancing act on the edge of life and death—they come down to the looming threat of tough moral choices, the same kind of lives-trading compromises The Avengers couldn’t force themselves to make earlier this summer. One might wish that McQuarrie pushed that predicament further, that he really forced Hunt—playing bad to ensnare the really bad—to inch up to the edges of his ethical limits for the sake of the greater good. But Fallout’s almost inexhaustible supply of sticky situations provides suspense aplenty: This may be the closest this peerless series has ever come to making us believe that the mission may actually be impossible.